Crystal Clarity with Cartridge ConvenienceThe Clean & Clear filter will keep your pool sparkling day in and day out. It features a cartridge that is easy to remove and rinse, as well as a clamp ring that allows easy access to the cartridge and internal parts. High-Flow™ Manual Air Relief ValveThis powerful valve and continuous internal air relief work together to maintain optimum filtration efficiency at all times. 75 SQ. FT. CARTRIDGE FILTER SYSTEM WITH 1 H.P. OPTI-FLOW PUMP. PENTAIR 100 SQ. FT. CARTRIDGE FILTER WITH 1.5 H.P. OPTI-FLOW PUMP. 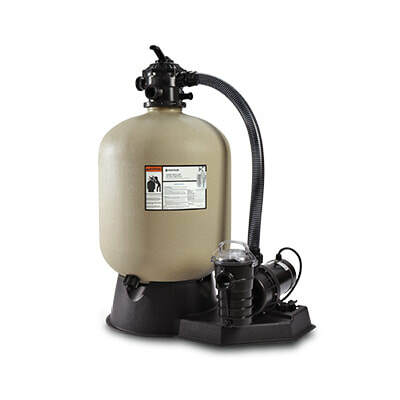 ​PERFECT FOR ABOVE GROUND POOLS WITH 10,000 TO 17,000 GALLONS. 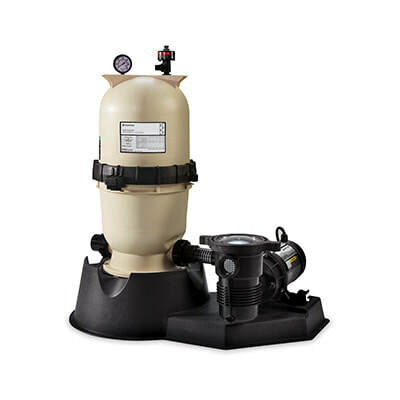 PENTAIR 150 SQ. FT. CARTRIDGE FILTER WITH 1.5 H.P. OPTI-FLOW PUMP. FILTER TANK WITH 75 SQ. FT. CARTRIDGE. REQUIRES 150LB. FILTER SAND (OPTIONAL). SAND FILTER TANK WITH 6 POSITION VALVE. NEEDS 200LBS. OF SAND.